Is Swaddling a Baby to a Bed with Safety Clips Helpful or Hype? I am a complete and total Dr. Harvey Karp aficionado. Dr. Karp explains that swaddling is an excellent way to help newborns have a good night’s sleep. Dr. Karp cites a study from 2002 that babies who are swaddled, or wrapped tightly in cloth before being put down to sleep, were more likely to sleep on their backs and have a goid night’s sleep. Dr. Karp has developed the SNOO Smart Sleeper which includes an easy swaddle blanket that attaches to safety clips on the bed. The concept is that babies cannot roll onto their tummies (increasing risk of SIDS) and remain comforted and improve sleep by using the swaddle. 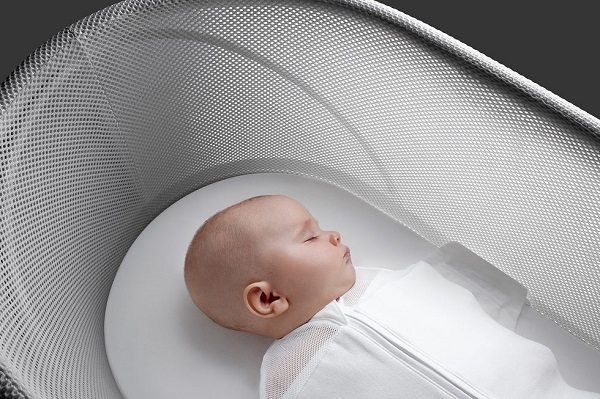 The SNOO Smart Sleeper is the only baby bed on the market that clips babies safely into the bed to prevent rolling. But, is swaddling an infant to the bed a good idea? Having newborns sleep on their backs is a position that is suggested by most pediatricians for prevention of Sudden Infant Death Syndrome (SIDS). Therefore, the American Academy of Pediatrics (AAP) warns to stop swaddling babies once they can roll. Some babies can roll by themselves as early as 2- to 3-months-old. But, the AAP also recommends having babies sleep on their backs until 6-months-old. Obviously the dilemma is that if a baby isn’t swaddled and can roll before six-months they will roll onto their tummies while sleeping. Despite the AAP recommendations, I have also heard from a few nannies and parents that they have actually done something similar on their own because it was taught to them by their grandparents and parents. They just use a long swaddle blanket and secure the blanket below the baby, to the crib, so the baby is safe and secure. If you are a staunch Dr. Karp supporter, then you will agree that the SNOO Smart Sleeper is the safest bed on the market for babies. If you haven’t read Dr. Karp’s books, you may think the concept is hype. Let us know what you think below, on Facebook, Instagram, or Twitter.